HANOI (Reuters) - The White House barred reporters from Reuters, the Associated Press, Bloomberg and the Los Angeles Times from covering a dinner between President Donald Trump and North Korean leader Kim Jong Un on Wednesday after two of them asked Trump questions during his initial interactions with Kim. The reporters are part of the White House press pool, which covers the U.S. president wherever he goes. Reporters in the pool regularly shout out questions to leaders and on Wednesday they asked Trump about the summit and the testimony in Congress of his former attorney and fixer Michael Cohen, in two separate opportunities known as "pool sprays." The reporters were later excluded from covering the dinner because of what White House spokeswoman Sarah Sanders said were "sensitivities over shouted questions in the previous sprays," the Washington Post reported. The pool was present when Trump and Kim first met and shook hands. 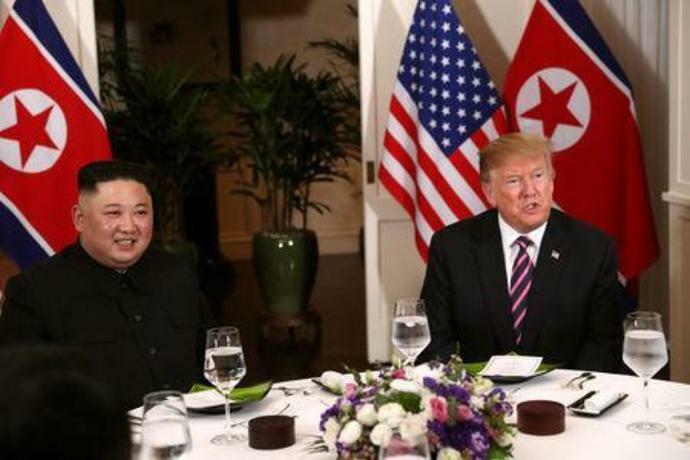 During that short initial meeting, while cameras were rolling, Reuters correspondent Jeff Mason asked Trump what he wanted to achieve at the summit and whether he had backed away from his demand for North Korea's denuclearization. Trump replied "No" to the second question and gave a longer answer to the first. AP reporter Jonathan Lemire then asked Trump if he expected to end the Korean War. Trump said: "We'll see." Reporters were escorted out of the room. Shortly thereafter they were brought back in to listen while Trump and Kim, seated this time, visited. At the conclusion of that "pool spray," the AP's Lemire asked Trump if he had a reaction to Cohen's testimony due to take place later on Wednesday. With excerpts from Cohen's prepared remarks having already been made public, Trump scowled and shook his head. Cohen accused Trump of being a racist, a conman and a cheat. After the second interaction, pool reporters returned to their work space, followed by Sanders, who voiced concern about the questions asked and announced that the third "pool spray" would be limited to photographers. Pool reporters argued against the move and persuaded Sanders to include a print reporter and a radio reporter along with the television journalists. The four reporters, Mason, Lemire, Justin Sink of Bloomberg News and Eli Stokols of the Los Angeles Times, remained excluded. "Due to the sensitive nature of the meetings we have limited the pool for the dinner to a smaller group, but ensured that representation of photographers, tv, radio and print Poolers are all in the room," Sanders said in a written statement. "We are continuing to negotiate aspects of this historic summit and will always work to make sure the U.S. media has as much access as possible." Reuters said it was "deeply troubled" by the exclusion of Mason and other reporters from covering the dinner. "We believe it is essential that government provide access to - and the ability to ask questions of - officials and hold them to account," Reuters said in a statement. The Associated Press said it opposed White House efforts to restrict access to the president. "It is critically important that any president uphold American press freedom standards, not only at home but especially while abroad," said AP spokeswoman Lauren Easton. Los Angeles Times executive editor Norman Pearlstine called the reporters' exclusion "another sad example" of the White House's "failure to uphold the American public's right to see and be informed about President Trump's activities."